As some of you may know I started this little bloggy right at the beginning of the year (2016) with yarn in hand, creativity abounding, and no expectations. It’s been 9 months since then and BOY have things changed. Work on becoming a consultant for new bloggers & sharing my knowledge! Yep, you read that last bullet right!I’ll be putting together a guide all about how to start your very own Crochet/DIY/Craft Blog very soon — what do ya think? Leave me a comment below! Wanna learn exactly how I made thousands blogging? Yes, give me all the tips and get me blogging too! i would love to take advantage of your services as a consultant. Your blog and tips are encouraging me that anything is possible. In the last year I’ve taken up crochet since being taught many years ago by my grandmother when I was a small child. I have been exploring options for how I can use it to make an income. Having rediscovered my love of creativity through crochet and being very unhappy at work is pushing me hard to do something for myself. I have spent the last year practicing my craft at every possible moment and visiting lots of craft events to see if I’m any good. I’ve realised that I am very clever and can do this but I need some help to get going. My salary is a lot to give up and I’m the chief breadwinner in our house so there is a lot riding on my success. Hey there! I’m so happy you find my tips encouraging! At the moment I am not offering consultant services, but in the next few months I’ll be putting together many more articles on what exactly I’ve done to grow my blog and earn an income. I do recommend going ahead and getting started while still working – have your blog on the side and build up the content/get in the groove slowly. I have a post here on how to start your blog: https://www.sewrella.com/start-diy-blog. Hope this helps, and thanks so much! I am very curious how much time you spend a day blogging? Great question Julie! I never spend more than 4-5 hours a day “working” – now that can be writing blog posts, working on social media, crocheting, etc. But I do generally work just about every day on one thing or another. I try to keep up with comments and questions as well as emails daily and I always have a project in my hands while I relax and watch TV! (But where do I draw the line at work and play when my job is so fun??) And I never hesitate to take a day off when my 6 month old isn’t feeling well or I have other engagements going on. Hope this helps! Yes, I’m interested in blogging. I love crocheting, am self taught (even before youtube) and would love to share what I know with others AND make money! I wouldn’t even know how to start a blog though..I read your comment from below and will check out that site. I am VERY interested in creating a blog for profit! I am a self-taught crocheter (even before the days of youtube)! My grandmother used to crochet, and I too, have one of her granny square blankets! Thinking of a domain name…my FB page is Snug As A Bug by Beth but I feel it’s too long…I’d love any advice and tips you can give me and I’d love to receive your emails! But I originally closed the page and now it won’t come back for me to sign up! Thanks so much for sharing your expertise! Hi Beth! I love the name Snug as a Bug! The trick is finding something new and original – this one took me a while but once you find your stage name you’ll know it’s perfect. Put a blast out on Facebook and see if people have any clever suggestions? I’ve realized this is a great way to tap into all those creative minds out there. 🙂 As far as my email list, if you view the web version on my blog there is a sidebar box where you can enter your email! I came across your blog while perusing Pinterest! Although I crochet tons, your link to blogging came up instead of your crochet work. ? So, I’ve been thinking about starting a blog for some time now. 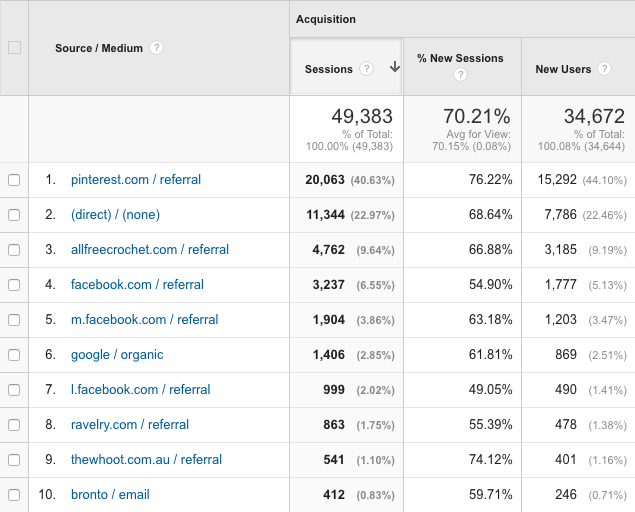 From what I told, it’s very difficult to grow a decent size income (from getting traffic to ads and such). Also, my concern is content. Now, I’ve been crocheting for several years, but I’m not one to create my own patterns. I buy patterns as well as make the free ones that catch my eye. So, that’s what I do. I’m also starting to dabble with knitting. But, again, content is my main concern and then gaining traffic. Now off to look at your patterns! I’ll also be putting together a post soon on driving traffic to your blog so stay tuned! I have been looking for something and what do you know I have read 2 of your blogs today. Hmmmm maybe the universe is trying to tell me something. Please add me to your list of people that needs an extra push.